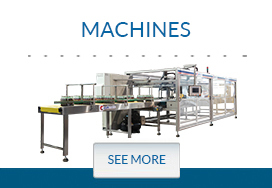 Capacity to pack up to 260 packages per minute in double track, this machine has an integrated architecture that allows the control of all sets from only one program. The separation system can be done from the superior or inferior parts and be controlled by two servos, possibilitating greater facility in change of formats. Involvement system of film with independent servo, more precision of the film on the package, and system for height adjustment facilitating the setup. The change of conveyor belts is much simple, since the ensemble of climb of the film is in drawer format, optimizing time and gaining in efficiency.